In the introduction to this series-in-a-series, I said that I would talk about one danger and one opportunity for each way of interacting with stories. For this post on making stories happen, "everything you do is a story" is both the danger and the opportunity. The danger in making stories happen lies in doing it without knowing it, and in doing it wrong. I'll talk about making stories without knowing it first. When soldiers descend to the ground in helicopters, they typically ride with their booted feet hanging off the sides. When US soldiers first went to Afghanistan, this innocent practice generated many local stories, because showing the soles of your feet is considered a deeply offensive (and usually deliberate) insult in most Arab countries. Soon the military started training soldiers about this and other insults, but the stories remained. Similarly, just a few months ago Israelis were offended by a photograph of President Obama talking on the phone with Israeli Prime Minister Benjamin Netanyahu - with the soles of his feet prominently displayed on his desk. In both cases nobody told a story, and the actions may have been inadvertent, but stories came from them nonetheless. Another danger story in this category happened around this time last year when three CEOs of US automobile makers flew in private jets (at the estimated cost of $20,000) to ask the US Congress for taxpayer money to bail out the car companies. To make matters worse, a statement from a Chrysler spokesperson said that they flew in private jets for "safety" reasons. The stories that flew around this incident surfaced many feelings about class and money and humility in the United States. "Heads they win, tails we lose again!" "They really, really, do not get it." "Are their lives any more valuable than yours or mine?" "$20,000 is more than a lot of hard-working people see in a year." "Not even they will drive a US built car." "I will never buy or recommend another American auto again." Now imagine that you are trying to sell the cars made by these companies. Puts you in a bad spot, doesn't it? Makes it harder to pull off a "we care about you" sort of advertising campaign, doesn't it? "Alan Mulally, CEO of Ford, understands the importance of symbolic gestures and public relations. Yesterday, for example, when he arrived on Capitol Hill, hat in hand, hoping to convince lawmakers to help bail out American auto manufacturers, he arrived in a new Ford Fusion Hybrid. Ford's media team, of course, made sure reporters knew about this.... If only Ford's p.r. team had thought about the other leg of the trip. How one gets to the Hill from the hotel isn't quite as interesting as how one gets from home to D.C."
So the people at Ford had been trying to make a positive story happen, but they hadn't thought it through well enough (or couldn't? ), and a negative story happened instead. And the story they made happen (of failure to make their preferred story happen) was the worst story of all. Like a virus that lies dormant for years, stories you make happen can come back to bite you long after you have forgotten them. People make new stories happen every day, in all the things they do. But the great majority of stories are small and quiet. They live small, quiet lives within a family or group of friends. But the life of a small, quiet story can change in an instant. Consider what happens when somebody gets noticed by society. They run for office or start a company, or they are in the right/wrong place at the right/wrong time, or they do or create something interesting or wonderful or horrible. Suddenly all of their small, quiet stories come flooding out into the public sphere, from teachers, classmates, neighbors, colleagues, friends, family members, people who met them on the bus. The public uses these small, quiet stories to check the new, big, loud stories for veracity. Perhaps the person running for office has a history of dishonesty, or the person accused of a crime has been a pillar of the community, or the whiz-bang inventor has been accused of plagiarism in the past. Say a person runs for Congress. Everything seems to be in order. They have built their career slowly and carefully, making many friends and few enemies. They have mastered the art of public discourse and built a deep understanding of policy. They are well loved for prominent actions that have helped many people. Many good stories have been told about them. Their story seems destined to continue with their taking on the mantle of public representation. But then something happens that not only derails their political future, but retroactively changes the perceived story of everything that happened before. Now the fact that they led their high school debating group seems sinister instead of stately. Different stories start to come out, about how they kicked a neighbor's dog, or didn't show up for a job, or snapped at a customer. In the end the whole story gets rewritten, from start to finish, and they are a different person than they were - possibly even to themselves. That sounds scary, but the good thing is that positive backflow works the same way. Former heads of state often actively create positive backflow by devoting the remainder of their time to earning their place in history. Here is an example of positive backflow. I heard this story several years ago and can't remember where, but I think it's true(ish). A company's CEO put out strict new rules for cost cutting, one of which was that nobody was to fly business class until things improved. A few days afterward the CEO went to the airport to board a flight. The airline staff recognized him and immediately bumped his coach ticket up to business class. Here was a moment of decision for the CEO. His company wasn't paying for business class, so why not take the upgrade? After a pause he decided that he wouldn't feel comfortable sitting in business class after what he'd said. Near the end of his flight, to his surprise, several company employees who were also on the flight came up and told him how impressed they were that he was following the guidelines he had set. When this story got out in the company, that CEO's ability to ask people to take other cost-cutting steps improved dramatically. Here's the most important part of that story: the CEO didn't know he was making a story happen when he gave up his first-class seat. But he acted as if he did. You know that thing you tell little kids about Santa Claus watching them? Maybe we should start telling grown-ups that. Just so you know, this idea of making stories happen on purpose is not at all a new idea. I first enountered it in the work of Alan Wilkins, who in a 1984 paper called "Organizational stories as symbols that control the organization" (in Organizational Symbolism) described how managers who want to create organizational change through storytelling cannot simply rely on telling stories; they should also (or instead) make stories happen by taking "dramatic action in the name of values." I'd make that "based on" values rather than "in the name of" values, because "in the name of" still sounds a bit fake. ... most employees at one company I researched have been told the story about how the company avoided a mass layoff in the early 1970s when almost every other company in the industry was forced to lay off employees in large numbers. Top management chose to avoid a layoff of 10 percent of their employees by asking everyone in the company, including themselves, to take a ten percent cut in salary and come to work only nine out of ten days. This experience became known as the "nine-day fortnight" by some and is apparently used as a script for the future of the company. In 1974 the company was again confronted with a drop in orders, and it went to the "nine-day fortnight" scheme for a short period. When other companies in the industry began layoffs, the old-timers used this story to quiet the anxiety of concerned newcomers.... Employees occasionally tell [this] story to communicate that this is the "company with a heart". Everyone I talked to in the company knew the story, which is used both as a symbol and a script. Now that's effective story making. The paradox of it is, the most effective story-making happens when the people taking the dramatic action have no intention of making a story. They are just doing what needs to be done, and they have good reasons for doing it. The story-making is a result, not a cause, of the action. I want to make a special warning about publicity stunts, because when I say "make stories happen" it may seem that I am talking about this. 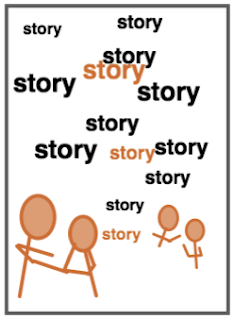 So what is a person or company or group to do if they want to make a positive story happen? How about this? Do good stuff. It's amazing how refreshing that is nowadays. In a world where everybody is spinning, standing still stands out. Find dramatic actions based on values. Find things you can do in which your personal or corporate values are apparent. Make sure they are big enough to get noticed (that's the "dramatic" part), but be careful not to artificially expand them. Find them, then do them, and don't make too big a to-do about it. And as the Ford group found out, make sure your values soak all the way through the action and aren't just painted on the top of it. People will notice, because they are looking for it. They are hungry for it. And they will tell the stories for you. I buy a lot of my clothes from Land's End. This is partly because I like their clothes, but part of it comes from a story they made happen, possibly without even knowing it. When I was in graduate school one of the people I knew lost his house to fire. He lost every single thing in the house. Somebody in the department sent a letter to Land's End saying how this guy and all of us loved their clothes, and could they send him a few shirts. They sent a huge box with something like a thousand dollars worth of new clothes. (That was more than a month's pay at that time.) We didn't ask for it, but they took dramatic action based on their values. They didn't publicize the incident; they didn't make him do a commercial; they just helped him out. I'll bet that everybody who knew about that incident has probably told the story of it many times. Here are a few examples from consulting projects. On one project a colleague had done for a retail chain, a true story had been collected in which an employee did an excellent job of defusing a difficult customer situation. This person's actions exemplified what the company wanted all of its employees to know it stood for. The company wanted to use the story in a motivational program, and they wanted to improve the motivational aspect of the story by tacking on a fictional ending where the employee was rewarded for their right actions. I suggested that instead of tacking on a fictional ending to the story, they find the employee, actually and visibly reward them, and then ... not bother telling the story at all. The story would tell itself. It's not that hard to find opportunities to make positive stories happen. Just listen to people. Listening to stories about needs and fears and beliefs is a good way to find opportunities to take dramatic action based on values. But you can't find such opportunities by asking people to tell you "success stories." You need to find out things you aren't sure you want to know, like why people don't trust you, and why they choose other brands, and what they think your values are, and what nasty rumors they have heard about you. This requires a degree of self-awareness, honesty and courage that is not always available at all levels of every organization. And then, when you find out what dramatic actions you could take based on values, it requires another layer of courage to actually do them, because some of these require you to give up some control or safety or freedom. But the rewards can be great.